What should have been a day of hope in Kenya- celebrations of the promulgation of Kenya’s new constitution were in top gear- has ended up in great disappointment as Kenyans realized that their government invited the Sudanese President Omar Al Bashir, who has a warrant of arrest from the International Criminal Court to the Uhuru Park celebrations in Nairobi. Bashir was not arrested. He was escorted to Uhuru Park by the Kenyan Tourism minister Najib Balala. Peter Muli and Francis Kihara, ordinary citizens who like most Kenyans survive on a meal a day but have the courage to defend their country and democracy are in police cells for protesting Omar Bashir's invitation to Kenya. On 15th March 2005, Kenya ratified the Rome Statute of the International Criminal Court. Kenya became party to the Statute as number 98 and today the ICC has 108 members. The Statute entered into force for Kenya on 1st June 2005 a day Kenya celebrates having received internal or self governance from the British in 1963, Madaraka Day. Can we really say the people have internal self government today? I feel that the Kenyan government has sold out our self governance. Indeed in the first place, the people should have been the main celebrants in the promulgation of the new constitution which we say, we the people of Kenya, give ourselves.” Instead military power took centre stage and we did not even know our full guest list. In an endless night of watching rights abuse with only a few candles left to burn, I see Bashir astride our lands in Africa, from Chad to Kenya, Cairo and Sudan and I see a graveyard of human rights without hope as Africa looks more to China today. Who will stand with us? The U.S.A is not part of the I.C.C and Europe is being bashed as the colonial past machinery in Africa. Yes, we can stand alone and we did, but how does the world justify international diplomacy, the UN and all the money we pay to have a ministry of Foreign Affairs, and all that Diplomatic Corp in Nairobi from where it serves the Horn of Africa? We are, especially we the women who are raped daily in Congo and in Darfur and other places, betrayed all the time. Where do we begin? Kenya has bound herself by law to facilitate the work of the ICC because Kenya has signed up to do so. Kenya did not do that. A valid question is therefore what does any law, including the constitution of Kenya mean to the Kenyan state? Another question is about those who facilitated the post-poll violence of 2007 in Kenya. Will they be brought to book by the Hague since the 10th Kenyan Parliament failed to form a local tribunal to try the suspects and this remained the only option for justice to be meted against perpetrators of this violence? By entertaining Bashir, it would seem they were taunting the ICC and saying, look at us, you can do nothing. Honestly, Kibaki, am so ashamed of you. I have not forgotten that some months ago, you burned my mother’s granary so that you could see the words as you swore yourself back to power on the strength of a flawed election. I cannot forget this because many people died and because you know, your government has denied consistently, a report on the disappeared people of Kenya, the home desaparecidos. The ICC is investigating the violence which happened in Kenya in 2007, and time and time again, The Prosecutor of the ICC, Moreno Ocampo has said he has a number of important names from Kenya that he might want to bring to book. Today, many of us Kenyans have doubted that such a move will ever work. 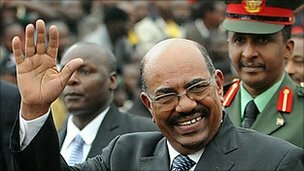 Omar Bashir was in the wrong place at the wrong time. He was in Nairobi and he was not arrested. I shudder to think that he went, he saw and returned home leaving easily cheated Kenyans in great disbelief. The skeletons cry in Darfur, blood is hidden in shallow graves in Kenya, and we celebrate and sing. The police broke up the demonstration with tear gas and arrested two individuals from Bunge La Mwananchi (The Peoples’ Parliament) and as a free Bashir eats a sumptuous dinner tonight after fasting in the day as it is Ramadhan, the two lie in the inhospitable Kenyan police cells in which I have also spent some nights in the past for peacefully demonstrating against police impunity, police brutality and corruption. The two are injured and will be in the cells for three days before they can be brought to court because today is a weekend. What kept us from using the money you used to entertain important your guests from financing a 24/7 court in Kenya? Have you forgotten the Internally Displaced Persons still in camps? It is no doubt that the President of Kenya Kibaki and the Prime Minster have sent a very sad signal to Kenyans today. I feel and see that we are all sitting at the graveyard of human rights abuse and thinking of rising some day against such realities as have been Darfur in Sudan and Kenya’s disappeared, dead in poll violence, over 1 300 and so many thousands of Internally Displaced Persons, I can only say, help my unbelief in a resurrection, in change! We are tired of situations of mass deaths like in Darfur, Kenya in 2007 and we must see that change happens not only to Kenya but to all neighboring countries. There is not time to waste. I do not know why the world does not feel the urgency for the deaths in Darfur, I do not know why the world does not feel like me tonight about the arrest of Omar Bashir. I do not know why the people of Sudan think that this would be an affront to their leader. We cannot afford to have governments that do not hold human rights in reverence and who all too easily blame the west as our people die under poor political organization. But the media observed quickly that the US is not a party to the treaty that established the ICC in 2002, the one Kenya has ratified and broken today. George Bush saw the ICC as a violation of US sovereignty and his successor has not revised this position. The U.S. A here joins China, North Korea, Saudi Arabia, Zimbabwe and Sudan in not ratifying the Rome Statute. The ICC has 108 member countries. I protest even more strongly that anyone continues calling the defence of human rights a western notion. We are either all human or we are not. We are either all in solidarity against the Bashirs of this world or we are nothing. I know I cannot choose Kibaki’s friends for him, recently he entertained his Iranian counterpart Mahmoud Ahmedinejad of Iran surprised me. He invited him on when the two met in the UN General Assembly in New York in September 2007, a few months before the violence we endured. He also invited Muammar Gaddafi but turned down the Dalai Lama. In searching for oil in Kenya, the Chinese who were not as effective as some western counterparts take the first place in Kenya. I have also heard Kibaki speak lightly of the ICC saying that maybe Kenya could after all renege (whatever that meant) the Rome Statute. As Bashir straddles over the graveyard of human rights in Africa, how can we rise? The Kenyan government would have us believe that Bashir stole his way into Kenya as we promulgated our constitution, no he did not. He was a guest of the state. The state concealed his name as a guest on the list for this special occasion from the public, the media and the international community. This is betrayal. After a long day and efforts to speak about Kenya’s recent achievements, I cannot sleep tonight. I will keep vigil and write as I have promised my arrested colleagues who not only boycotted events organised by the state but also took to the streets. I am away and I remember the faces of Somali, Ethiopian, Sudanese and Eritrean people as I spoke today about Kenya’s possible success. They smiled at the healing of a neighbour hoping for the same. There are far too many African refugees for us to take human rights abuse lightly even for a second. If these men do not feel the urgency for change the way we do, they should just step down. Philo Ikonya is a Kenyan writer, journalist, academic and human rights activist. She has written articles for journals, web magazines and blogs, often commenting on the social and political situations in Kenya and Africa. Ikonya has also written poetry and novels.